When the time comes for planning your next birthday party for either an adult or kid, anniversary, retirement, wedding reception, family reunion or other holiday social events, such as: Christmas, Hanukkah or New Years Eve, choose Balloons Over Atlanta to plan your event. Gayle Rubenstein is a Certified Event Planner with extensive experience. Our team will carry out the theme you select and furnish the decor and all other pieces that will make your event sizzle! Most parties have a theme, consider selecting one from the ideas below, or create your own. You are limited only by your imagination. Oscar Night, New Years Eve, Christmas, Sweet Sixteen, Prom, Debutante Debut, Divorce Party, Black and White, Masquerade Mask Party, 1920's Party, Savoir Faire Guest Party, Sweet 16, James Bond 007, Moroccan, Hollywood, Retirement, Las Vegas, Kid's Birthday, Bridal Shower, Star Wars, Mardi Gras, Egyptian, Pool Party, 80's, Winter Wonderland, Quinceañera, College Party, Kid's, Hawaiian Luau, Corporate Anniversary, First Birthday, Fraternity and Sorority, Winter, Car, NASCAR, Princess, Carnival, Dog, Zoo, 70's, Italian, Child's, Arabian Nights, Hollywood Theme with Balloons, Romantic Anniversary, School, Atlanta, Tea, California Beach Boys, New York, Old South, Southern, BBQ Company Picnic, Stone Mountain, Dinner Party, Space, Autumn, Caribbean, Cinderella, Sponge Bob Square Pants, Boy's Party, Western, Holiday, Casino Party, Mexican Fiesta, Formula One Racing, Trains, Horses, Jungle, Ocean, St. Patrick's Day, Valentine's Day, 50th Birthday, 30th Birthday, 21st Birthday, 40th Birthday, July 4th, Independence Day, Clown, Circus, Evening in Paris, Knights of the Round Table, Medieval, Greek Toga, Senior Graduation, Family Reunion, Horse Racing, King and Queen, Prince, Bridge, Bunco, Bar/Bat Mitzvah, Opera, Boats, Roaring Twenties, 1940's, 1950's,1960's, Fall, Cowboy and Indians, Casino Night Charity Benefit, Broadway, Miami Deco District, Latin Night, Halloween, Mother's Day Tea, Bon Voyage, Going away, American Idol. Venue...Many factors will determine what type venue will work for your celebration. Traditional ballrooms may provide just the right touch of elegance or perhaps a trendy nightclub effect, hip loft space or outdoors with a tent will compliment your party best. Entertainment...The choice of entertainment is also an important factor. Balloons Over Atlanta know all the popular live bands, DJs, comedians, harpists, comedians and other fun entertainers, such as balloon artists, face painters, fortune tellers. Decor...Balloons Over Atlanta will make sure the decorations and look of your event will create that "Wow" reaction in your guests. Decorative elements such as props, linens, chair covers, lighting, balloons, centerpieces, trees and plants, candles, candelabras or other table decorations, favors, religious favors, printed menus and place cards and balloon creations, such as trees, arches, columns, sculptures that compliment the theme are the forte of this team. Catering...Balloons Over Atlanta knows all the best caterers in the Atlanta, Georgia area. Whether you need a heavy hors d'oeuvres or sit down dinner for your event, you will have delicious and creative catering that will be talked about for years. If you want a lovely theme cake for your child, adult, or event, that can also be part of your food presentation. Other services to consider are staging, lighting effects, tent rental, invitations, photographer, parking, guest transportation, signage, hotel and lodging, security. 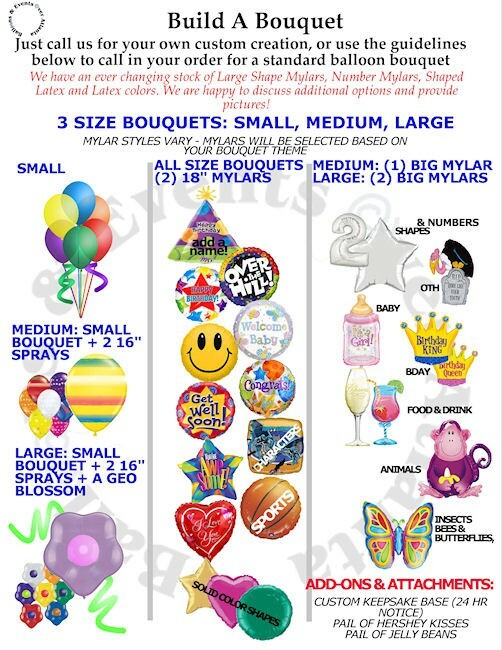 Balloons Over Atlanta is familiar with the top vendors in all these categories and will put it all together for you.